In the fall of 1993, my wife was pregnant with our fifth child in four years. Our oldest children were Crystin and Gwendolyn, identical twins that would turn 4 years old in February. It had been a very good year for us in that we had helped defeat a proposed waste dump that was slated to be built next to our small ranch. As Christmas approached, we seemed to have beaten our biggest troubles. We noticed that Crystin had become unusually irritable just before Christmas. Normally, the twins enjoyed dressing up for Christmas pictures, but this time Crystin cried inexplicably. A short time later I noticed that Crystin’s pupils were dilated and slow to respond. Believing she may have received a head injury, I took her to the emergency room. The doctors assured us there was nothing wrong with her. My wife and I both work, so in the evenings by the time we were all together, we were grateful that Crystin wanted to doze off so quickly. Crystin had never slept well before and was usually the last to fall asleep. As Crystin appeared more lethargic, we became more concerned. I took all the children into the pediatrician who diagnosed them all as having throat infections. Two weeks later, Crystin seemed even more tired, and her daycare provider was noticing similar problems. Friday morning we made an appointment to take her back to the doctor. When I arrived at the daycare, all the children were outside playing except Crystin. When she heard my voice, she jumped off the couch she was lying on. As she came toward me, Crystin shuffled sideways, her head pointed away from me as if she could only see out of the corners of her eyes. I knew enough about neurological dysfunction to know that Crystin was in real trouble. We raced to the pediatrician’s office. Ten minutes after he saw Crystin, we were across the street waiting for a CT scan. As Crystin’s brain was being scanned, I could see the attending physician’s face as she watched her monitor. When she brought both hands up to her cheeks, I left a world that I will never return to again. Crystin’s CT scan had revealed a large tumor in the right ventricle of her brain. We rushed to the University of California at San Francisco for an MRI. That night the doctors there confirmed that Crystin had a large brain tumor. The next morning they informed us that the cancer had coated Crystin’s entire central nervous system, spine and all. One of the hazards of being a policeman is that you tend to size up bad situations quickly. It took my wife 3 days before she understood that Crystin was going to die. Monday morning, neurosurgeons removed most of the tumor in Crystin’s brain. When she awoke, her vision had improved and she begged us to take her home. We had explained to her that she had an "ow-ie" in her head, and that the doctors had taken it out. She couldn’t understand why she had to stay in the hospital, and we couldn’t tell her. The pathologist determined Crystin’s tumor to be an extremely rare and fatal cancer called the malignant rhabdoid tumor. Her case was put before a board of doctors and specialists called the Tumor Board. They only had two recommendations. Either take Crystin home to face her inevitable death within months, or try "aggressive" chemotherapy and radiation simultaneously, which might buy her some time. Prior to Crystin’s illness, I could not have told you whether the word cancer had two "C's" or an "S" in it. I had trained to face critical incidents with confidence and authority, but my child was never supposed to be in the equation. The terror my wife and I felt went beyond description. We consented to the treatment Crystin’s doctors offered. We were told that UCSF was one of the foremost cancer research facilities in the world, and that our doctors were the very best. When they described some of the horrible side effects of the potential treatment, my wife called them barbaric, which they indeed were. The doctors admitted to us that there was no cure, and that the treatment would at best buy Crystin some time. Our hope was that with what we believed to be scientific breakthroughs happening every day, Crystin would still be alive when a cure was found. We were told that because of the combined effects of chemo and radiation, there would be a higher possibility of death in the short run. This was because Crystin’s immune system would be so devastated by the "treatments." In the long term, even if a cure were found, Crystin’s spine would be shortened from the radiation and she would lose some IQ points. If we were to save our daughter, we would have to accept these tradeoffs. Over the next 6 months, we literally tortured our little girl. Crystin’s urine burned her from the poisons, and we had to use rubber gloves to change her diapers. She threw up constantly and lost weight rapidly. We played a constant game of trying to get her to eat more than she lost. Every little cold was life-threatening, and no comfort from us could ease her suffering. I doubt whether Crystin had a comfortable night's sleep ever again. Crystin’s hair fell out rapidly. The radiation burned her skin, and most of the time she was confined to bed. Even through all this, Crystin’s will to live fought on. When she didn’t like the feeding tube that we placed into her stomach through her nose, she made a deal with us. Three times a day she would push the tube into her nose by herself so that she could be fed, and then she was allowed to remove the tube after each feeding. We had no idea how unusual that was until one day a nurse was watching Crystin do it. She called a bunch of other nurses who gathered around Crystin’s bed to watch. At the end of 6 months, Crystin’s treatments were finished and the tumor was 95% gone. We knew it would come back soon, however, and then there would be nothing left to do. My wife and I began reading through alternative cancer books and learned of a clinic in Houston that seemed to be having success with brain tumors. I contacted the Burzynski Research Institute and began to investigate his treatment for our daughter. The more research I did, the more criticism I heard from other doctors. Strangely however, all Dr. Burzynski's patients spoke highly of him and believed that his medicine was saving their lives. Because I am a police officer, I looked for the usual indicative factors of a fraudulent operation but found absolutely none. There was no pressure from the Clinic for us to go there or to spend money without careful consideration. 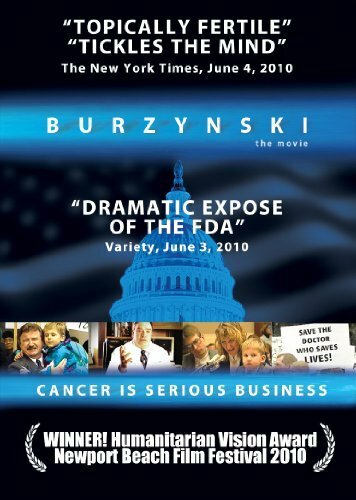 Burzynski had been in the same location for 15 years and had a fairly impressive capital outlay for his clinic and laboratory. We could not determine whether Dr. Burzynski’s medicine would cure our daughter’s cancer, but clearly he was not a fraud. Crystin's oncologist was concerned and asked us to speak to a colleague of his who supposedly knew all about Dr. Burzynski. I met with Dr. Prados, head of neuro-oncology at UCSF. He told me that Dr. Burzynski’s medicine did not work and that he had testified against Burzynski in court. He suggested other experimental and toxic therapies, but by then we were weary of chemotherapy. I took Crystin to Texas with the expectation that I would get back on the plane the second my suspicions were aroused. I became convinced that I had made the right choice 30 minutes after I arrived at the Clinic. All around me sat patients who were having unbelievable successes against their cancers. On the wall was a startling 'before' and 'after' MRI of a small child with a brain tumor who had been completely cured. For the first time since Crystin got sick, I felt that I was in a real medical facility where hope was a legitimate option. When I met with Dr. Burzynski, he simply said that he had some success with brain tumors and that it was worth a try to help Crystin. My 9 years of police experience told me that this doctor was both honest and brilliant. We started Crystin on the treatment right away, and I began to experience the same sense of hope that I had seen in the other Burzynski patients. Within months, Crystin became cancer free. Eighteen months after starting on Dr. Burzynski’s treatment Crystin was still cancer free. My wife and I had been living a miracle as each successive MRI showed Crystin improving. Strangely, our doctors continued to remain unexcited about Crystin’s improvement. Crystin improved neurologically during her first year on Burzynski’s treatment but then started to decline. She had suffered an embolism and numerous physical setbacks. Crystin’s vision seemed to come and go, as did her ability to walk. By Christmas of 1994, Crystin had difficulty speaking. We came to the conclusion that Crystin was probably cured of her cancer. We stopped the treatments on December 1st to focus on the other problems Crystin was experiencing. By December 27th, the tumor was widespread in her brain again. Every doctor confirmed for us that there was no question but that the tumor had returned. Interestingly, after everything that they had seen, no doctor recommended that we start up Burzynski’s treatment again. They recommended their experimental and toxic therapies. We immediately put Crystin back on Dr. Burzynski’s treatment. In 3 weeks, her tumor was reduced by 20%. In 9 weeks, the cancer was completely gone. As soon as she was cancer free again, our doctors concluded that she had not had a recurrence but, rather, a mass of cells had died off from the radiation treatments a year and a half earlier. As absurd as that notion was, it was the only explanation that they could accept. While Crystin’s cancer had apparently been beaten, our troubles were just beginning. The UCSF oncologists decided for some unknown reason that Crystin was not worth saving and refused to treat her anymore. Our own doctor was brought before the UCSF ethics board twice over this issue. All that came of it was that the UCSF oncologist had some unexplained prejudice against Crystin. The head of UCSF’s pediatric department volunteered his doctors to admit Crystin, whose problems were getting worse. Crystin’s neurological functions continued to deteriorate. On July 29, 1995, the bravest and strongest little girl I have ever known died absolutely cancer free. Her autopsy revealed the ultimate cause of death was brain damage as a result of radiation and chemotherapy. We believed in our daughter until the very end. We had seen her fight back from near death before, and we were sure she would do it again. What we didn’t know was that the treatment she had received from UCSF was not actually what we had been told it would be. No matter what cure we had found, Crystin would have died. I received a call from Dr. Julian Whitaker several months after Crystin’s death. He had gone to the Burzynski Clinic to investigate the medicine’s efficacy. He had called to ask me why I hadn’t tried Dr. Burzynski’s medicine first, before the before the radiation and chemotherapy with their irreversible side effects. Dr. Whitaker had been in contact with two other Burzynski patients with brain tumors who had failed UCSF’s treatments and had gone on to be cured by Dr. Burzynski prior to my daughter's treatment. The doctor of one of those patients was the same Dr. Mike Prados who had told us not to go. In fact, Dr. Prados had testified that Dr. Burzynski had cured that patient. Why did Dr. Prados lie to us? If UCSF knew, or should have known, that there was a potential treatment that had cured terminal brain tumors with no long-term side effects, why didn’t they tell us when we asked if there was any other possible treatment? When we checked into the care that our daughter received from UCSF, more and more questions arose. We spoke to other parents whose children had received radiation and found that our daughter received twice the level of radiation that other children received. It seems that the radio-oncologist was so confident that our child would not survive, he gave her a lethal dosage of radiation. From his perspective, Crystin would not live long enough for us to see the long-term effects of his radiation treatments. He felt that we would be grateful for his extending her life a few months, so why tell us. Of course, he wasn’t planning on us going to Dr. Burzynski and having our little girl cured. Our experience with Crystin’s doctors is not an unusual one. We are not the first persons that were expressly lied to by their doctors regarding chemotherapy and radiation. With respect to terminal brain tumors, these doctors have a dismal cure rate. Their treatments amount to nothing more than unjustifiable and fruitless experimentation on human beings. Any doctor who treats brain tumors and knows of Dr. Burzynski’s work or has seen his treatments cure their patients, has an ethical duty to inform their other patients of the medicine’s existence. Those who do not fully inform their patients, whether because of ego or monetary reasons, must be held accountable. Crystin’s doctors knew they could not cure our daughter’s tumor. They knew their treatments would have severe consequences, which they blatantly lied about. They knew of a potential cure for her cancer because they had seen it work in other patients, yet they chose not to mention it. When we found out about Dr. Burzynski, they lied again and tried to dissuade us from going to Houston. When we chose to use Dr. Burzynski's treatment, the oncologist refused to treat our daughter even though her only medical problems were a result of their "treatment." To this day, the doctors at UCSF refuse to support patients who chose to go to Dr. Burzynski. They continue to lie to their patients about the efficacy of Dr. Burzynski’s medicine and frequently cite "ethics" as their main concern. These same doctors, and their associated hospitals, make a great deal of money providing their patients who have cancer with harmful drugs that do nothing but reduce the patient’s quality of life. What could their ethics be if the welfare of their patients is so unimportant? We cannot bring our daughter back. However, we are in a position to have her death bring about a change in the way patients with cancer are treated. Our family has chosen to take UCSF to court in the hope that we can force values and ethics upon these doctors who do not act in the best interests of their patients. While our case is substantial and convincing, it will be a long hard battle. We would appreciate support from anyone who feels they have an interest in demanding full disclosure, proper informed consent, and ethical treatment from their physicians. Submitted by Ric Schiff to the Burzynski Patient Group website.